4"H Resin figure. Holding a lantern and Santa medallion w/functional bell. Verse on Heart: As big as your heat can give. 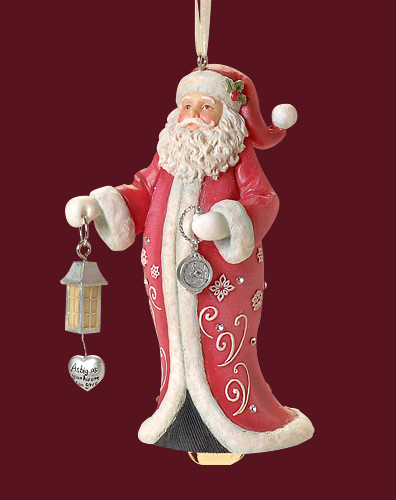 This adorable fully sculpted santa hanging ornament has a real bell underneath the skirt. Holding a lantern dangle with a heart that is engraved with the message "As big as your heart can give" makes this such a unique piece. Embellished with scroll detail, crystal rhinestones and a touch of glitter. A must have to decorate your tree!